The boom times in transportation and logistics are giving many companies a boost to the wallet. Where should trucking and freight companies invest this added cash in 2018? The smart money is on one place – truck driver retention. Below is a list of the top 5 reasons to invest in truck driver retention in 2018, complete with industry statistics and insights to back them up. 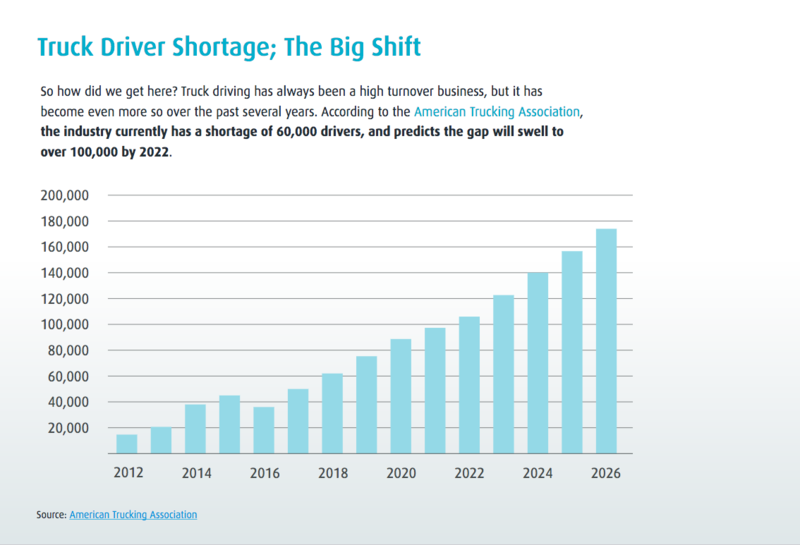 According to the American Trucking Association, the industry currently has a shortage of 60,000 drivers, a gap that will swell to over 100,000 by 2022. Driver retention is a key way for transportation companies to win the war for trucking talent. As their competitors feel the pinch from the supply-demand disparity with quality truck drivers, companies who maintain high levels of retention will gain a substantial competitive advantage. Increased regulation and mandated use of electronic logging devices (ELDs) means tighter adherence to rules and potentially lower pay for drivers which is causing drivers to flee the market for sunnier pastures. Industry fixation on transportation data aside, it’s important to note that blockchain and data collection offer precious little in the way of driver retention. We encourage you to listen to driver concerns by investing in driver feedback and communications technology. Fewer millennials are choosing truck driving as an occupation; there are simply not as many people willing to take on the difficult lifestyle and demands of a life on the road. With less young people joining the industry, the average age of a driver in the for-hire truckload industry has risen to 49. Trucking companies cannot underestimate the impact that Lyft and Uber are having on driver retention. These are companies that track their drivers, but offer maximum flexibility, quality pay and the ability to stay near home. There is a huge uptick in freight demand. Consumers are increasingly purchasing products online, which requires direct shipment, lots of trucks, and lots of drivers to move goods. Driver jobs are plentiful, but there aren’t enough people to fill the seats. Not only are transportation companies competing with traditional trucking and freight competitors, they are now dealing with new market forces who can offer drivers competitive pay and seem way more driver-friendly depending on the quality with which your company treats its drivers. Average hiring costs exceed $8,000 per hire. Carriers need to focus more heavily on retaining the good drivers they already have. If we have to spell out the basic economic benefits of retaining existing talent versus sourcing new hires, then you have bigger problems to solve, my friend. Looking for more insights? Check out the following resources on Workhound Resources page. 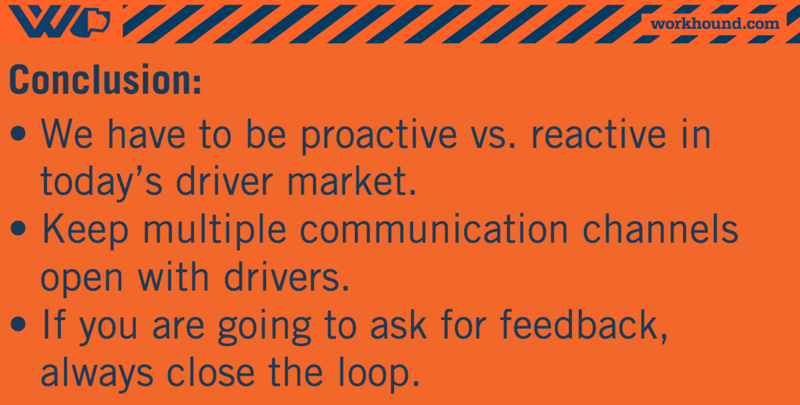 Ready to make driver feedback and communication a massive competitive advantage for your transportation company? Contact us to see how Workhound’s driver feedback solution can make your truck drivers happier, more productive, and more loyal to your company.